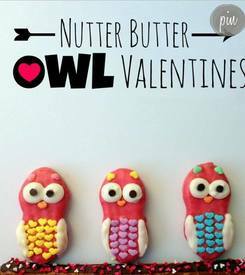 Nutter butter owl valentine cookies! Nutter Butters are the perfect canvas for a super easy and adorable treat with no baking required. No baking!? I’m sold. Don’t get me wrong, I love to get my bake on once in awhile, but these don’t make a huge mess and they are so dang cute.